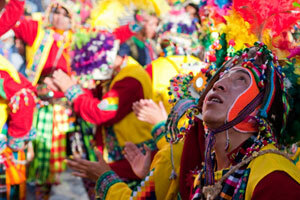 The carnival in Oruro, a city that was declared the Bolivian folklore capital by law, is a festival of different customs. It was declared a Masterpiece of the Oral and Intangible Heritage of Humanity by UNESCO in 2008. This is the carnival where religious symbolism and different cultures in the country meet, coexist and communicate in song and dance, in harmonious sounds and discords. It offers both the visitor and the native a spectacle worthy of the faith it represents and a moving devotion. Actually, carnival is a representation of the struggle of good against evil and the victory of the army of angels, guided by the Archangel Michael. It is all a profound veneration of the Virgin of the Socavón (cave), also known as the Virgin of Candelaria. A great number of faithful miners pray, plead with and worship this virgin as their patron saint. Although that is the Catholic interpretation of carnival, there are other interpretations. The Catholic figures take on other characteristics, personalities and spiritual manifestations that are peculiar to the indigenous people and cultures. Ancient rites, customs and traditions revive and survive during carnival. Symbolic sacrifices in ceremonial tables and a tremendous faith and worship of Pachamama land along with the ceremonies for the mountain spirits, Achachilas, and minor spirits, Mallkus, are a part of an ancient festival that moves from an indigenous form to a mestizo form becoming a reflection of the “interculturality” and cultural fusion that exists in Bolivian society. The ceremonies and customs of native people are hidden in the figures of the Virgin of Socavón and the Devils that dance in the folkloric parade. Even today the Jisk’Anata is held, a festival of Bolivian native people’s autochthonous dance and music, which is connected to the rainy season and the farming season (just like carnival). The background of this magnificent carnival is found in the sowing and harvest festivals of the Uru people of Oruro, from which the Department takes its name. These Anata festivals are part of the carnival ceremonies and are still practiced in its program. These festivals are characterized by community participation from different regions that dance to the music from each region and community. Many are stories and legends about the origin of the Virgin of Socavón, from an ancient Uru legend that identifies the virgin with a woman who defeated the evil god Wari and banished him to the depths of the earth, to the myth of Anselmo Belarmino, alias el Chiru-Chiru or el Nina-Nina, a petty thief who took away the houses of the nobles to divide everything up among the poor. A devotee of the Virgin Mary who failed to fulfill the promise he made, he tried to rob the house of a worker where he was fatally wounded. Left for dead in the street, he prayed to his patron saint for help. She not only helped the thief, but upon seeing his regret, absolved him so that he would die without blame. 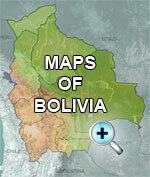 The miners found Nina-Nina’s body in the cave under the statue of the Virgin of Candelaria. Carnival is a happy festival full of color and rhythm. Dance, music, streamers, and confetti are common throughout the ceremonies, and children dress in costumes to participate in the children’s parades, play and are entertained by personalities like the pepino chorizo (folkloric clown), the jukumari bear and all the carnival figures, parties and games. It is impossible to explain in a few words the magic, dream and variety found in this typical Bolivian festival that attracts hundreds of thousands of tourists and involves more than 20,000 dancers and 10,000 musicians from all over the country who cover 4 kilometers dancing and making music. The Diablada, the Morenada, the Sicuris, Tobas, Caporales, Llamerada, Cullaguada, Los Negritos and many others are the incredibly rich and proudly Bolivian folkloric music and dance. 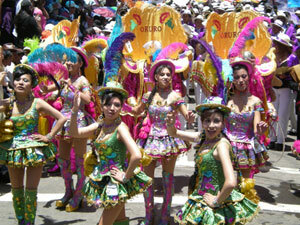 The carnival of Oruro is the biggest carnival of Bolivia and South America after the one of Rio.